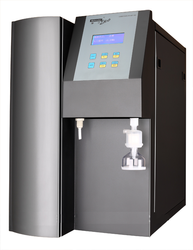 Our product range includes a wide range of molecular ultrapure water equipment (molgene 1810d) and molecular ultrapure water equipment. We are a trustyworthy organization offering a wide a gamut of Molecular Ultrapure Water Equipment (Molgene 1810D). The system mainly consists of pretreatment system, RO system, ultrapure water system conveying unit and control system. With full automatic control over the whole process, e.g. automatic water preparation, when water tank is full, automatically stop the system and cut off the power, water. 6) Terminal microfiltration: 0.22μm membrane or hollowed fiber membrane filter, which can filter out pollutants larger than 0.22μm, making the particles content (larger than 0.22μm) is <1/ml. We are a trustyworthy organization offering a wide a gamut of Molecular Ultrapure Water Equipment.